What’s your iPhone made of? Just looking at it, you might dismiss it as just a slab of metal and glass, with a dose of magic inside. 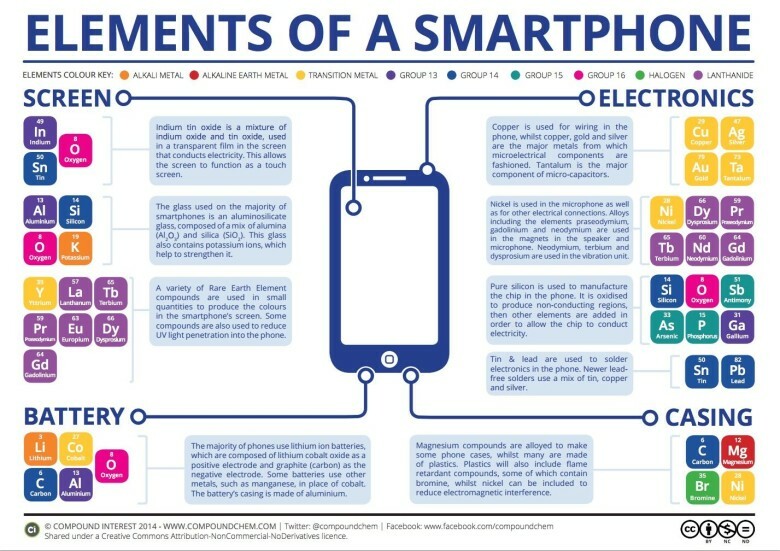 But our iPhones are actually portable chemistry labs, and there are an incredible number of complex chemical functions happening underneath the glass and metal shell that keep your iPhone ringing. In a post over at Compound Interest, a chemistry enthusiast blog, the hidden chemical processes that actually make your iPhone work are gone into in detail. It turns out it’s pretty fascinating. Sure, we all know that batteries charge and discharge thanks to chemical reactions happening inside the lithium-ion battery, but did you know that the screen of your iPhone is a chemical reaction happening constantly just underneath your fingertips? [iPhone screens] are manufactured mainly from aluminosilicate glass, a mixture of aluminium oxide and silicon dioxide, which is then placed in a hot bath of molten salt. The purpose of this is to allow smaller sodium ions to leave the glass and larger potassium ions to take their place; these take up more room and are pressed together when the glass cools, producing a layer of compressive stress on the glass and increasing its strength and resistance to mechanical damage. A thin, transparent, conductive layer of indium tin oxide is deposited on the glass in order to allow it to function as a touch screen – you can read more on how exactly touch screens function here. Several of the rare earth elements are also present in very small quantities, and have a hand in producing the colours displayed on the screen. Chemistry is very cool, and it’s something that we don’t usually think a lot about. Using your iPhone or iPad as a tool to explain chemical principles is a really awesome way to try to make more of us chemistry nerds.